The move underlined to what extent Theresa May has lost her authority. 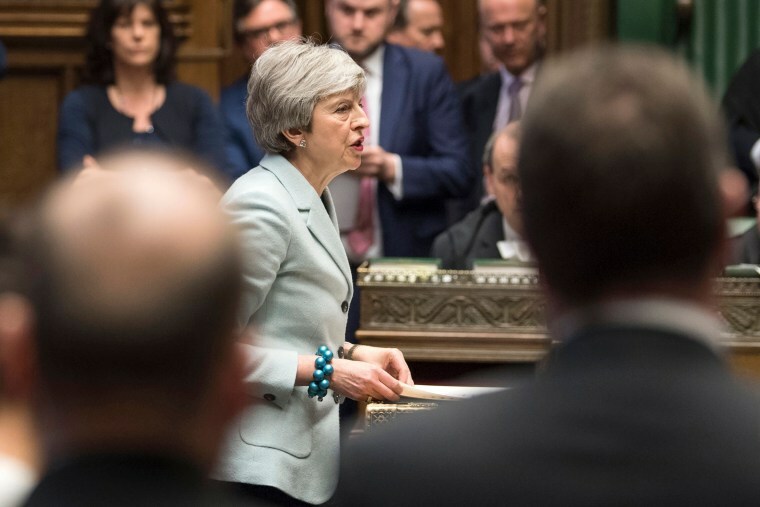 LONDON — British lawmakers voted on Monday to wrest control of Brexit from Prime Minister Theresa May for a day in a bid to find a way through the European Union divorce impasse that a majority in parliament could support. "No government could give a blank check to commit to an outcome without knowing what it is," May said before the vote. "So I cannot commit the government to delivering the outcome of any votes held by this house." European Council President Donald Tusk said last week that all Brexit options were still open for Britain until April 12, including a deal, a departure with no deal, a long extension — or even revoking Article 50 and remaining in the EU. May's deal was defeated in parliament by 149 votes on March 12 and by 230 votes on Jan. 15, but she had signaled that she would bring it back a third time this week. To get her deal passed, May must win over at least 75 MPs who voted against her on March 12 — dozens of rebels in her Conservative Party, some opposition Labour Party MPs and the Northern Irish Democratic Unionist Party (DUP), which props up her minority government but has voted against the deal so far.